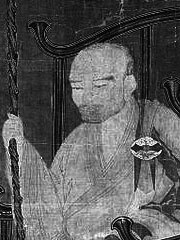 Jinul (1158 – 1210) was a Korean monk of the Goryeo period, who is considered to be the most influential figure in the formation of Korean Seon Buddhism. He was born at a time when the sangha was in a state of crisis, both in terms of its external reputation as well as on internal issues of doctrine. Deeply disturbed at the degree of corruption that had crept into the sangha, Jinul sought to establish a new movement within Korean Seon which he called the «samadhi and prajna society» (hanja: 定慧社, 정혜사, Jeonghyesa). This movement’s goal was to establish a new community of disciplined, pure-minded practitioners deep in the mountains. Jinul eventually accomplished this mission with the founding of the Songgwangsa monastery at Mt. Jogye.